Wealth. We all have some. We all want more. As a people, we desire to acquire. It doesn't matter if it is a wealth of finances, status, knowledge or property. We seek to grow in abundance of our assets. We live our days in an endless quest for plenty. Our motto is to always gain more... to always amplify our fortune (whatever fortune that might be). Despite character, our human nature is to esteem those who appear to have an opulence of wealth. Some presidents have been elected on their wealth of charisma alone. Some scientists have been given carte blanche to promote theories as facts merely because their wealth of education suggested more knowledge. There are so many forms of wealth that are enviable to us: beauty... money... fame... education... talent... fitness... charm... You name it, we want more of it... We want all of it! Yes, wealth in correlation to this world is very important to mankind. We stress and worry over losing it. For what would happen if we lost all our finances? How would we survive if we became paralyzed physically or mentally? What if we were no longer respected, appreciated, or liked for our efforts, our work, our contributions? Worse yet, what if we were forgotten entirely? What if our wealth amounted to so little that we were considered completely worthless... a drain to society... a loser? Oh my! How could we possibly survive if we lost our wealth? What more would we be if not for our sums and securities? For wealth is what makes the world go round, right? Worth, however, is different. Worth is about value. It is not about the acquisition or accumulation of plenty. No, worth is based on importance. It is determined by one person and is centered around an intended purpose. Worth to the world is inestimable for it cannot be measured by the same standards as wealth. In fact, it cannot be measured by any amount. It cannot be dictated by popularity or status or complexity or appearance either. Also, worth has nothing to do with the fringe of outside opinion. Rather, whatever is deemed worthy is uniquely appreciated... securely guarded... and completely adored by it's owner. Worth transcends wealth because it is independent of limitation and free to just be appreciated and treasured. In short, worth involves unchanging, unquestioning love. So in my book, worth trumps wealth any day of the week (and twice on Sundays)! For example, first and foremost man was made in God's image. What an honor, right? We bear the image of the One who is LOVE!!! I cannot digest and absorb what an immense blessing this is, but scripture confirms it to be true in Genesis 1:26-27. We are also described as fearfully and wonderfully made in Psalm 139:13-16. Scripture informs us that all the days of our lives were written down before we were ever born. Wow! What does this mean? Well, it certainly confirms that our Creator has a plan for our life. It solidifies that we each have an intended purpose. Also, did you know that in Ephesians 1, we are told that God chose His own people before the foundations of the earth were ever formed (vs. 4). He knew about us and chose to make us specifically - giving us value in His sight. Yes, God always intended to love us without measure while blessing us with His wonderful gift of purpose. What is our purpose? To praise and glorify His Name! But God didn't stop there. 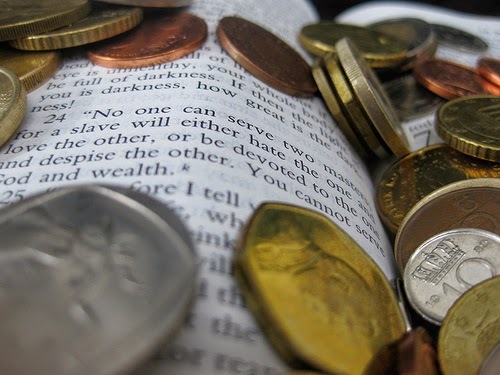 No, in addition to our worth, He also blesses us with His wealth. Not an earthly wealth of temporary, fleeting gains and losses... but rather the eternal, unchanging wealth of a royal inheritance in His Kingdom. God gives us the ultimate security by promising the presence of our King forever (vs 13-14)! So ladies, no matter what you estimate your wealth to be (or not be) according to earthly standards, please hear this life-defining truth: You are most valued and loved by a good and perfect Creator who wishes to give you everything holy! Your worth is determined by a Maker who transcends all space and time and wishes for you to live complete and secure in His grace. And His grace is the key to our worth, isn't it? For everything God has done for us has nothing to do with our own abilities, energies, contributions or efforts. No, no matter how hard we may try, there is nothing we could ever accomplish to deserve the honor of His holy, eternal presence or the mercy of His loving sacrifice. Yet, remarkably... thankfully, He offers Himself to us. With nail marks embedded in His hands, He reminds us of our importance to Him. He cares for us and encourages us to thrive in His perfect peace. Our glorious Father longs for us to experience a life void of limitations caused by sin and corruption and is at the ready to veto the power of death over us through the blood of His Son, Jesus Christ. Because of this, we are invited with open arms to be uniquely appreciated, securely guarded, and completely adored by a King who values us beyond all measure... who treasures us beyond all wealth and glory. This is LOVE, ladies. This is WHO God is to His people! He is worthy of all praise and glory and honor and worship! This is Jesus... sweet, remarkable, glorious Jesus! Today, I encourage you to consider the miracle that insures every Christian this truth and joy: God loves you! (See John 3:16-17 for confirmation!) No matter what happens on earth... no matter what trials and tribulations may come... always, always remember that God loves you! God loves His people! For while we were yet sinners, Christ still chose to die for us, and He is faithful to forgive and cleanse us from all unrighteousness!!! How great is the love of God who chose to pay the price to redeem and restore us even before we were born... even before the earth was created? The answer is this: His love is greater and deeper and farther and wider than all the wealth and glory imaginable... and that's just the beginning, for our God cannot be measured! WOO HOO! Ladies, this earth is loaded with whirlwinds of selfish distractions that will spin us away from WHO we should be focused on if our feet are not secure in His grace. Because of this, today I implore all DW's to remember your purpose. Remember what "healthy" really is in terms of your creation, and then consider WHO is really healthy. Rather than worry over the wealth of men... rather than stress over how to live with or without all that you've accumulated on this temporary planet - - let's fixate our eyes, energies and efforts on the richness... the power... the glory... the security... the beauty... the EVERYTHING of the ONE WHO IS WORTHY!!! For He has it ALL, ladies! He is LIFE to us!!! So, let's live today (and every day) like the gift it is and rejoice and be glad in JESUS! For by His grace we are saved... we are worthy... we are loved... we are alive!!! Hallelujah to the King for His unfathomable love! Let us never forget that we are worthy because HE IS WORTHY! Let us live every day treasuring WHO really matters: The King of kings. The Lord of lords. The Lover of our soul. Jehovah. The One and Only Great I AM. Jesus Christ the Holy Lamb!! !